Toru Okada’s cat has disappeared and this has unsettled his wife, who is herself growing more distant every day. Then there are the increasingly explicit telephone calls he has started receiving. As this compelling story unfolds, the tidy suburban realities of Okada’s vague and blameless life, spent cooking, reading, listening to jazz and opera and drinking beer at the kitchen table, are turned inside out, and he embarks on a bizarre journey, guided (however obscurely) by a succession of characters, each with a tale to tell. I guess you could say this is a disadvantage, or that it makes the story seem unfinished. 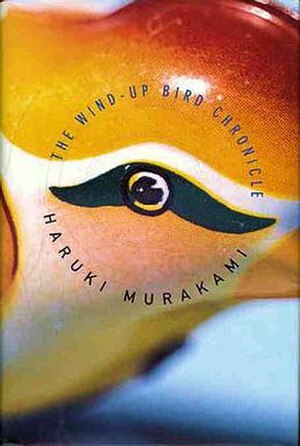 While I would like to know what happens next I also think Murakami of did a good thing leaving it up to the reader’s imagination. Plus in a way explaining everything would take away from what I loved about this book, the strangeness, the mystery. It gives the reader some choice too, they can choose to rationalise everything with their own expansion of the story, they can leave the ending as it is in the book, or they can give their own slant on the story which doesn’t diminish the strangeness. Personally I want to think about how things fit together, but I don’t want to rationalise anything- instead I want to extend the story to have the conclusion which I feel it would eventually come to and which I find most satisfying. I’m not giving full marks for this book because it took a while to really get going but I still rate it as one of the better books I’m read this year. Nice review, Lucy. I think I understand now why I didn’t want to try and link all the story strands up: you’re right, it keeps the story mysterious and strange, and that is what makes it so nice. Thanks Lee, I’m glad I gave some…clarity shall we call it?